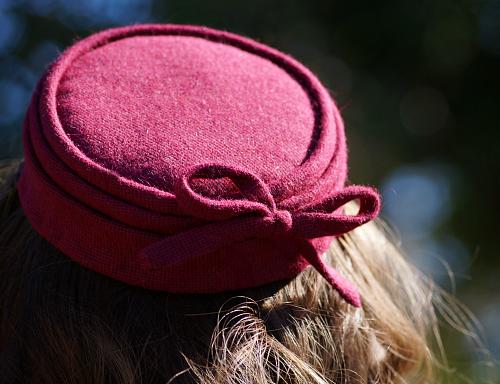 It's time for part two of my genuine vintage 1950s hat collection. If you missed part one, you can find it here. This little pillbox and the pink hat below were among my earlier buys, just two I ran across on ebay for a cheap price. Even though this pillbox could also be 1960s, I'm inclined to think fifties because of its small size. 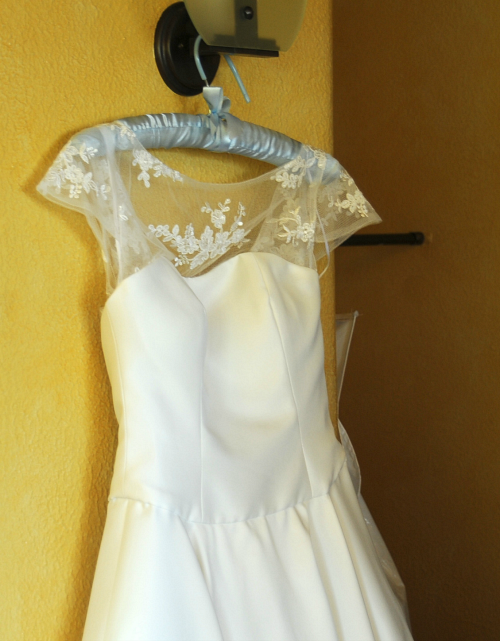 I love the colour and fabric, and the simple details and trim. This one is also adorably simple. A basic wired buckram frame that sits comfortably on the head, decorated with fabric swirl flowers. 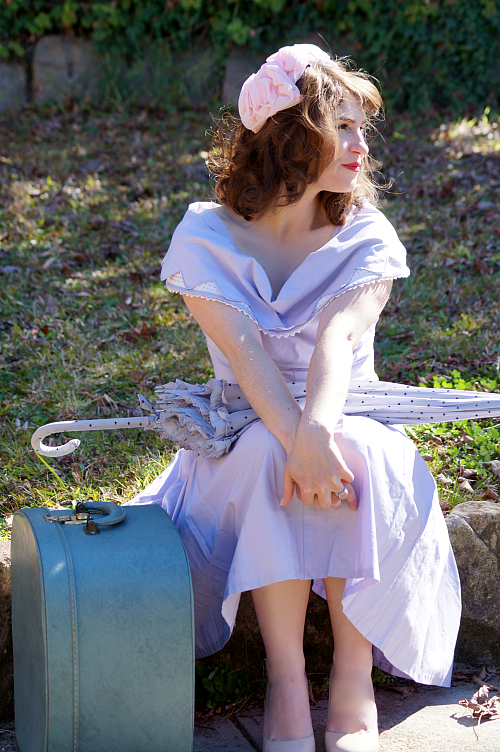 Along with the hat, my frilly umbrella and "honeymoon case" make great accessories to Ruanne's gorgeous vintage pale purple dress. 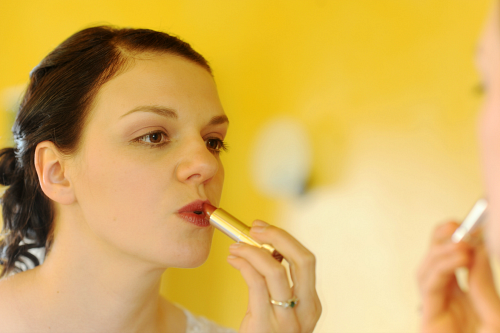 I love having models that come with their own wardrobe (and do their own hair and makeup!). 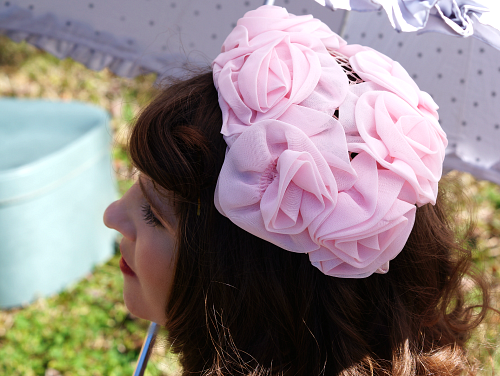 This one is actually one of the first vintage ladies hats I ever bought. (I have to say ladies, because I think my first purchases were some men's military hats.) 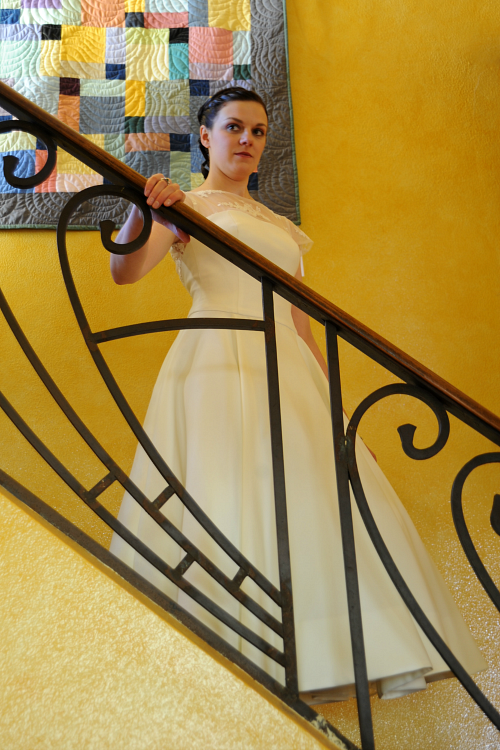 It came from a local vintage and consignment fashion shop that has unfortunately since closed. 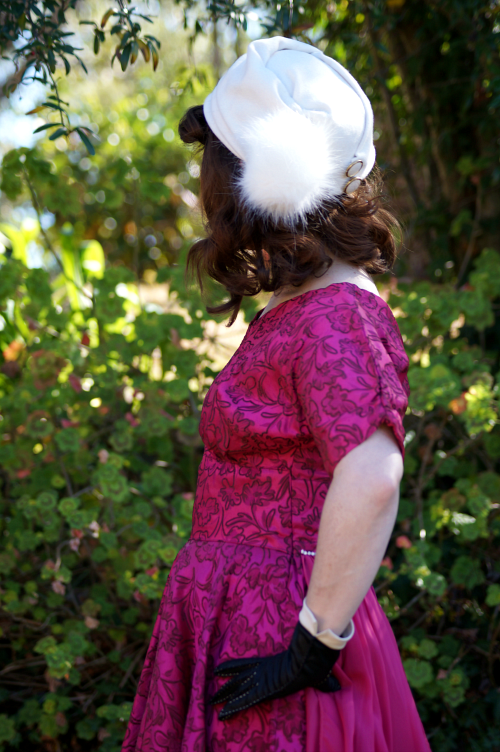 My mother and I always called this my "Jackie O" hat, but my husband calls it the "Brain" hat. 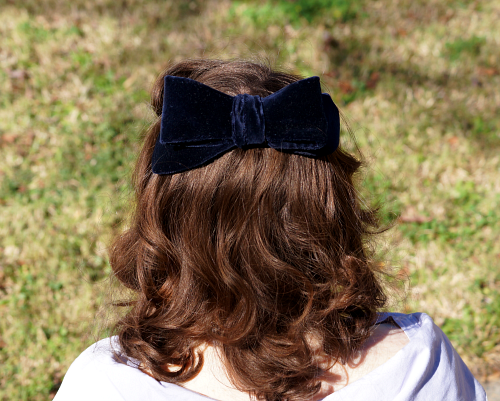 Also I used to wear it more with the bow at the back (less girly!) 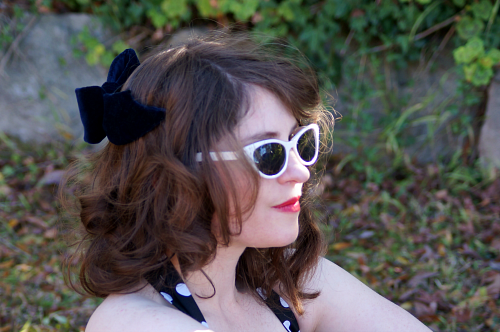 but I saw a 1950s magazine piece on hats almost exactly like this, with the bow at the front. The most frustrating part of this discovery is that I can no longer relocate that article. I'm 90% confident I didn't dream it. We started to have a lot of fun with props and different poses in this photoshoot, and I think this last one is my favourite! 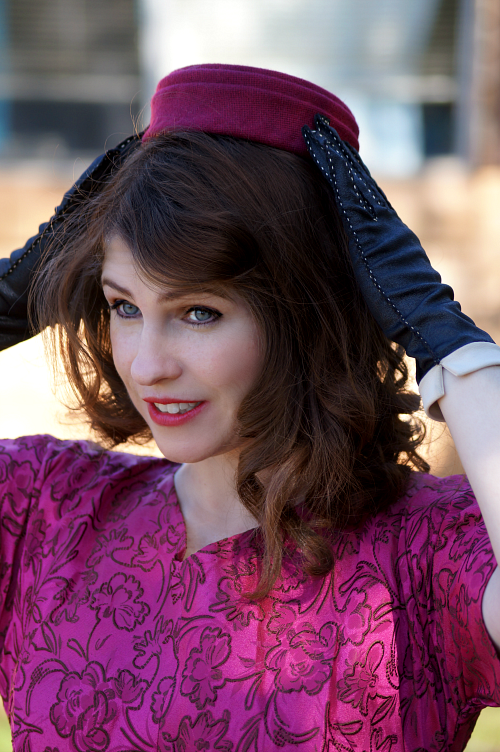 This is the last of the vintage hats from this photoshoot, but there is still one more set of my own creations. 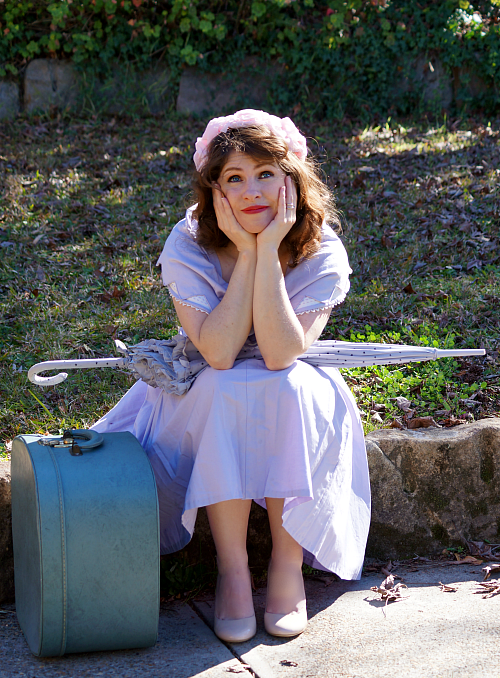 Plus, I've since acquired some more vintage hats, so another photoshoot will have to be done! I'm feeling nostalgic and sentimental lately. 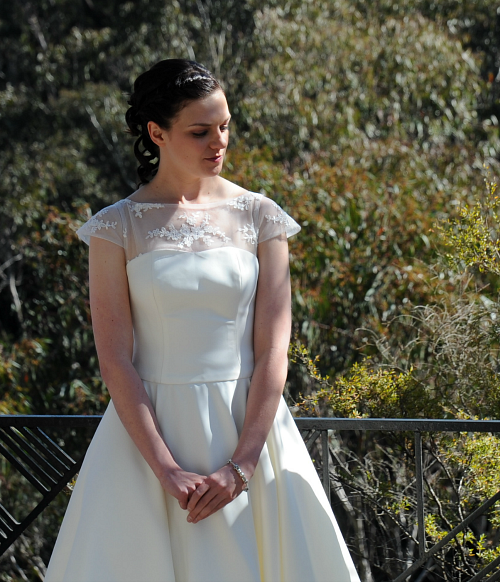 Two years ago today I got married, and before too long, we will be adding a daughter to our family. 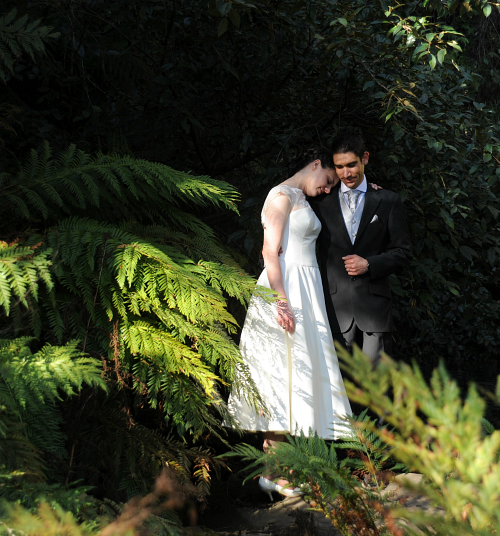 For now, some of my own (hatless I'm afraid) wedding pictures are my flashback gift to you today. Meanwhile, as this is automatically posted, I'm wandering these gardens again with my husband, reminiscing and looking to the future. 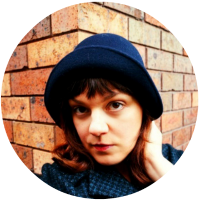 While researching vintage hat styles in The Australian Women's Weekly, I also found quite a few sets of patterns and instructions for making some simpler hat styles. I've attempted one of them, and I want to share it here with you today. It is described as a Butterfly Cap for teenagers for late-day or later. I found the teenage label unusual, because the woman in the article photo looks very sophisticated and grown-up to me. Once I made it myself, however, I found it looking much more youthful. 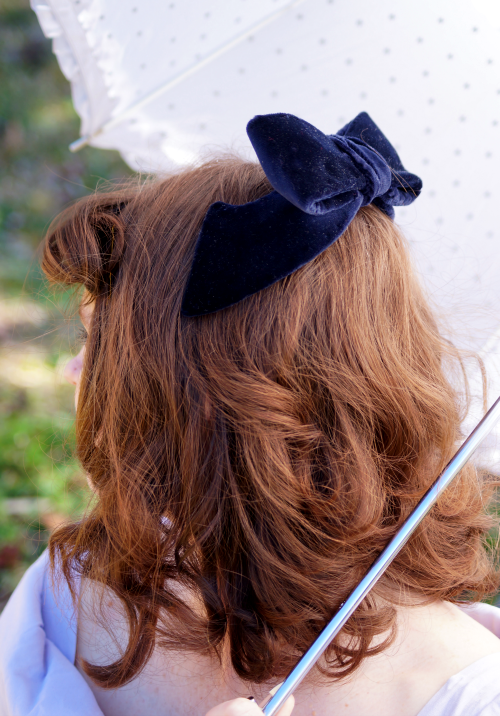 I think the hair and outfit styling will have a large impact on whether this little hat looks young and playful or elegant and sophisticated. You can find the pattern and instructions for The Butterfly Cap in the 9th of June issue of Australian Women's Weekly, on page 30, which you can access here. Like most vintage patterns, especially free ones squeezed into a small magazine section, the instructions are sparse and assume you can fill in the gaps. On the other hand, it's quite a simple one, so you would have a hard time going too wrong. The good thing about this design is that it's nice and clear what look you are aiming for! 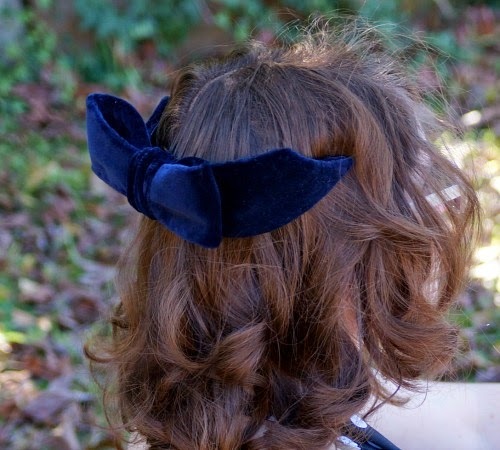 If necessary, fudge it, as long as it keeps looking like a bow! Experiment with the final shaping. Mine sits out like a more puffy bow, rather than sitting flatter like the magazine example. Both work fine, so play around to find the look you want. The best thing about this pattern is that it "is guaranteed to highlight your hair and make you look prettier". 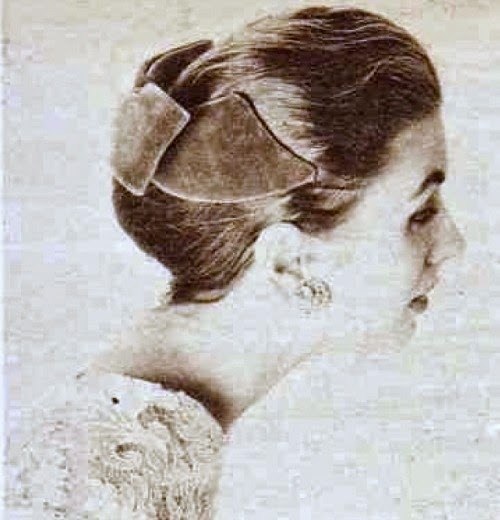 "High-fashion scarf hat" (1953). I love this one! And there are so many more. I found some of these while searching again for ones I had previously found! What do you think of The Butterfly Cap and the other hat patterns? Anything take your fancy? I'd love to hear if you try any of these, or of any other free patterns you recommend. 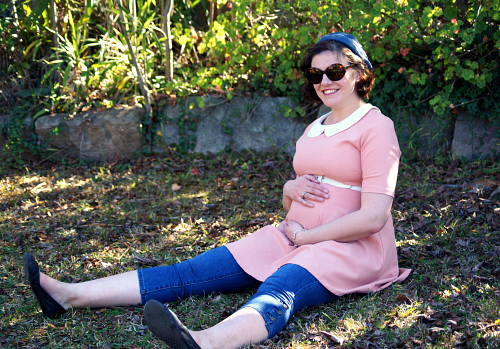 During the photoshoot with Ruanne, I put on some of my retro/vintage maternity outfits and did a bit of posing myself. This was at about 24 weeks. I got this peachy-pink dress (I'm pretty sure it is meant to be a short dress, not a long top, as I'm wearing it) with peter-pan collar at the Endeavour Op-Shop in Penrith. They stock a lot of "retro" clothes, some of which they import from Europe. I don't know why, but it is fabulous! 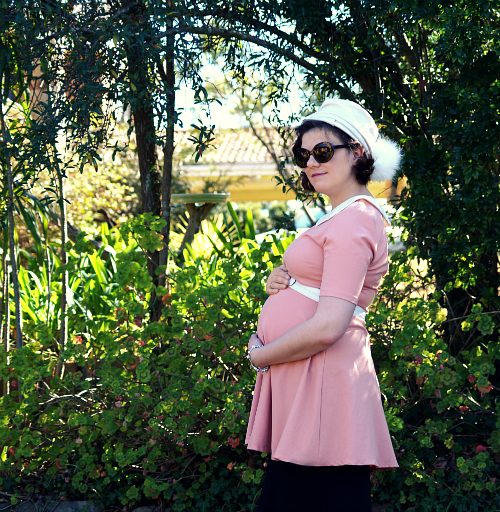 Styled with a white belt borrowed from my model's husband, a black skirt and sunnies from Endeavour, and the white wool and pom-pom hat inspired by the sketch from Australian Women's weekly. 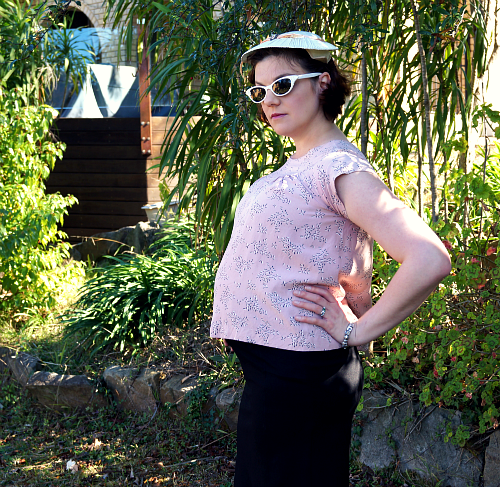 This is my one genuine vintage maternity top, purchased from etsy seller Edith Says, located in Melbourne. I would say it is 1950s or 1960s. It's a little shorter than I like my tops, but I can wear this black skirt quite high, since it has a lot of stretch. 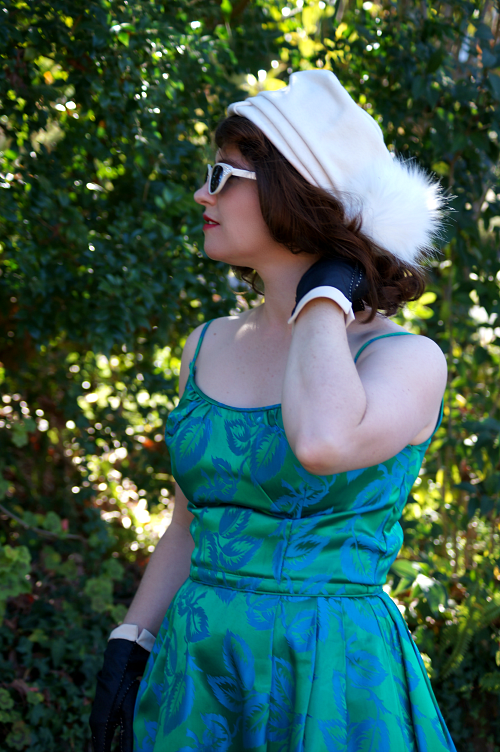 Here I'm wearing it with this darling 1950s vintage hat in pale greeny-cream and some sunnies given to me by a friend. I don't think they suit my face well in general, but with this hat they do! 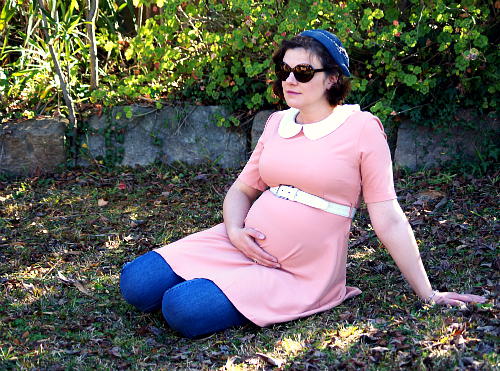 Back to the peach dress/top, this time with second-hand cropped maternity jeans and the genuine vintage 1950s blue corduroy hat. 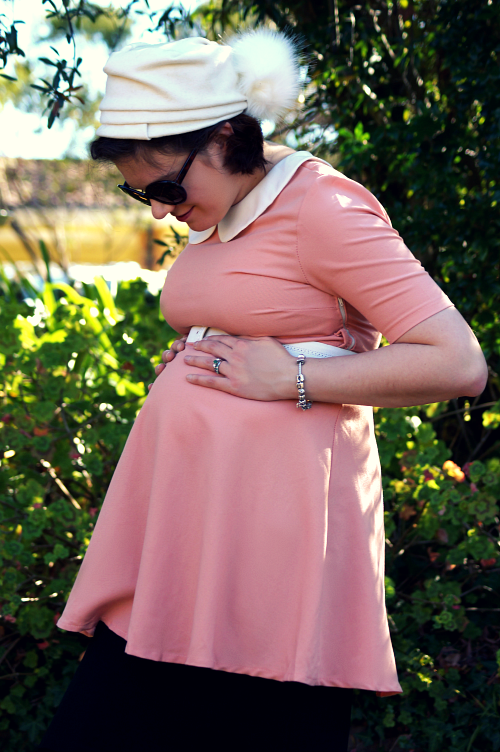 I have some more retro looks in my maternity wardrobe, including some tops I made myself from a 1960s pattern, and hopefully I will manage to get some good photos of them to share too. I wanted to make sure I got these ones done while I still fit into them! There has been a lot of expanding since then. 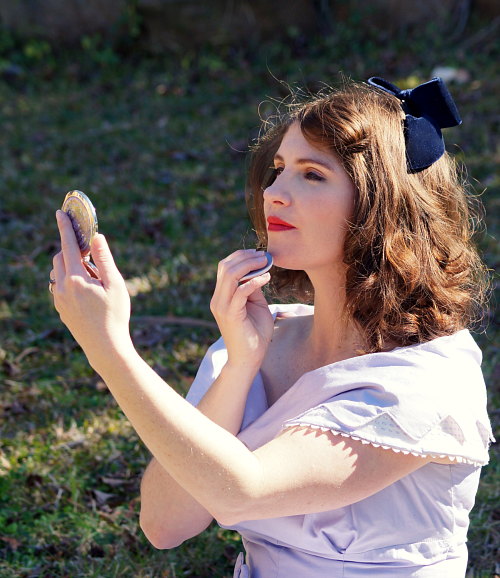 Continuing on with the recent photo shoot images, today I want to show you two of my own 1950s-inspired designs that my friend Ruanne modelled for me that day. (I'll be getting back to my genuine vintage collection later.) These are a couple of very wintery models, appropriate as we say goodbye to winter (although there is still time for more - that snow in October will not quickly be forgotten) and in the other hemisphere Autumn is beginning and maybe some are looking forward to cool-weather fashions. You may remember a couple of fashion illustrations in my 1952-1954 hat fashion trends post that featured pompoms. Very shortly after posting that, I had a go at a hat inspired by these shapes. After the fun I had starting to re-use my old favourite red coat, I decided it was time to retire my white/cream coat as well. Some bits were not so white anymore, even after cleaning. Between some of the whiter parts of the coat fabric, a couple of its buttons, and a bit of lovely white faux fur I had left over from cossack-hat-making, and the crown from an old synthetic straw hat (that's one lazy and quick way to get a crown to start draping on), I put together this homage to the pompom hats of the 1950s. 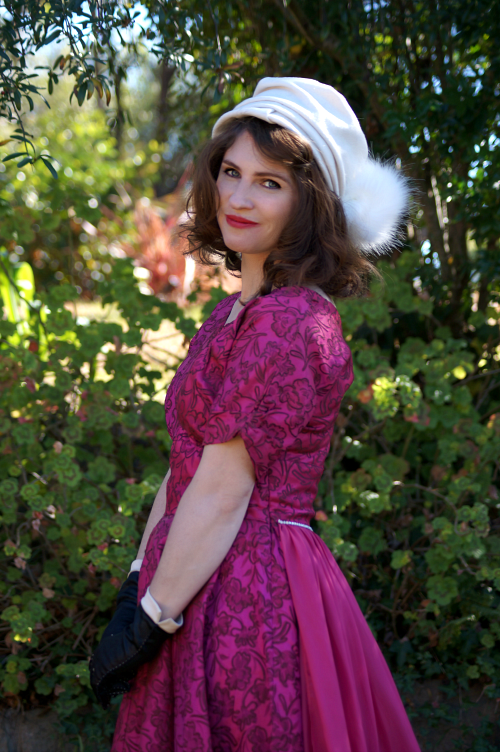 Despite being a very wintery hat, it managed to pair well with some very colourful dresses on an unusually sunny and warm winter day. I wore it myself the other day to the Norman Lindsay gallery with my grandmother for an exhibition of World War I photographs. It was fun and cute hat to wear out and about. You can't help but feel cute with a pompom, I think. This second hat is where the cheating comes in. I'll start at the beginning. 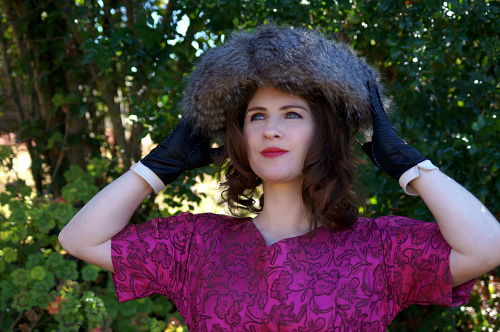 I love the big flat or slightly rounded fifties hats trimmed with fur or feathers that hang like a fringe over the wearer's face. One example, although from the sixties, is the fabulous hat from the first scene with Deborah Kerr in Marriage on the Rocks, which I talked about here. I found a lovely big round wooden bowl for a few dollars at an op-shop, and I knew it would be a great shape to block this type of hat on. I also found the fabrics I needed by op-shopping - a long-pile fur from a vest (oh yes indeed, it was really something!) and a long velvet skirt. I had one thing I wasn't sure of though. I didn't know how best to shape this hat, on the underside. How would it actually be worn? I debated a variety of ideas, and in the end just made the thing and hoped for the best. This turned out to be not such a great idea. Being flat on top, it is almost impossible to wear! So why did I continue and take it to the photoshoot? I guess it is a test-of-concept. I wanted to know if it would be worth altering or re-making this hat, and how best to do so, by seeing it in action, with the right outfit, model, makeup etc. I could see how it looked at different angles. A hat often doesn't show its true strength and beauty without being worn. As tricky as it was to play around with this awkward hat on the day, it was worth it. Although it is always going to be a statement piece, I love some of these photos so much, that I believe I can make the hat work after all. 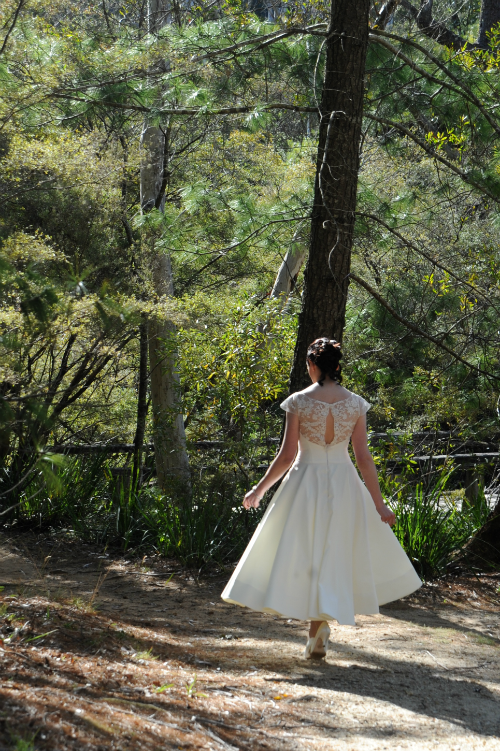 And if I can't, I got some beautiful images from it anyway! What do you think? 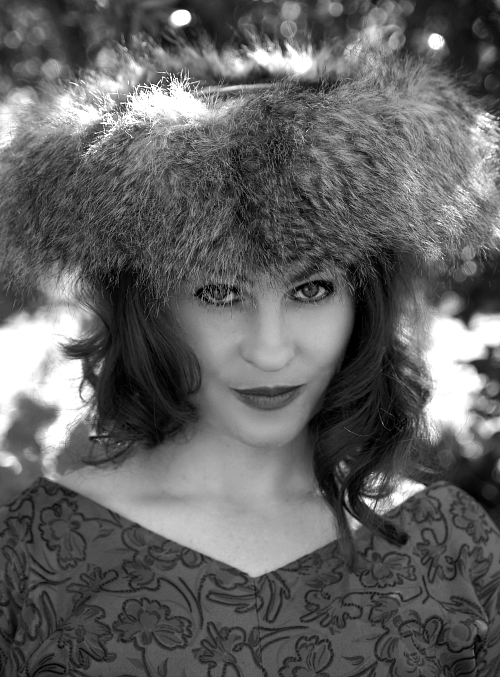 Do you think the fur hat is worth an attempt at redemption? Would you ever actually wear it? And how desperately do you want a hat with a pompom? It's ok, you can admit it.